Switchcraft 280 Mono Male Jack Plugs - Professional 6.3mm Audio or Guitar Connectors Switchcraft 280 professional quality 1/4 inch connector. 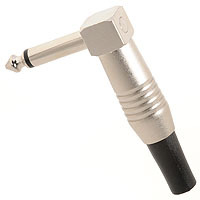 Nickel plated for durability, this mono 6.35mm jack plug has solder tags and an internal insulator and accepts cables up to 7mm diameter. Item code: 280. 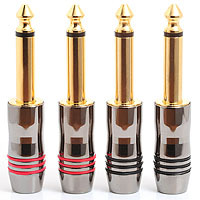 Gold Plated Mono 6.35mm Jack Plugs - Audio & Professional Speaker Cable Connectors High quality mono 6.35mm jack plug with stylish nickel plated handle. Gold plated for excellent sound quality with internal solder connection. Suitable for audio or pro speaker cables. Item code: JACPLU05. Mono Pancake Jack Plug - Right Angle 6.35mm Audio Guitar & Pedalboard Connectors Close fitting 90 degree mono jack plug, making it ideal for use on pedalboards. 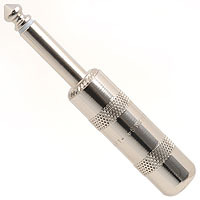 All metal shell, nickel plated for durability, with internal solder tag and shell insulator. Item code: JACPLU01. Mono 6.35mm Jack Plugs - Microphone Audio & Instrument Cable Connectors Nickel plated straight mono 6.35mm jack plug with solder tags and a rubber boot to prevent wear on your speaker or audio cables. Accepts cables up to 7mm diameter. Item code: JACPLU02. 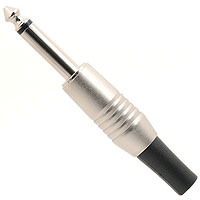 Metal Mono Jack Plug - Right Angle 1/4 inch Audio or Guitar Connectors Right angle 6.35mm connector with rubber boot to prevent cable wear, which can accept cables up to 7mm diameter. The compact design is ideal for use on guitars or pedalboards. Supplied with internal insulator. Item code: JACPLU03. 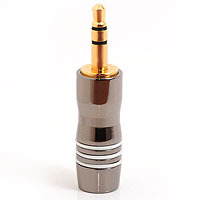 Stereo 3.5mm Mini Jack Plug - Quality Gold Plated Audio Connector High quality 3.5mm stereo jack connector suitable for for iPhone connections or replacement headphone plugs. 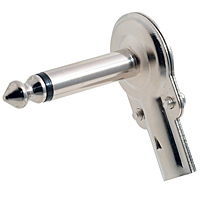 The stylish polished nickel handle can accept cables up to 6.3mm diameter. Item code: JACPLU04.